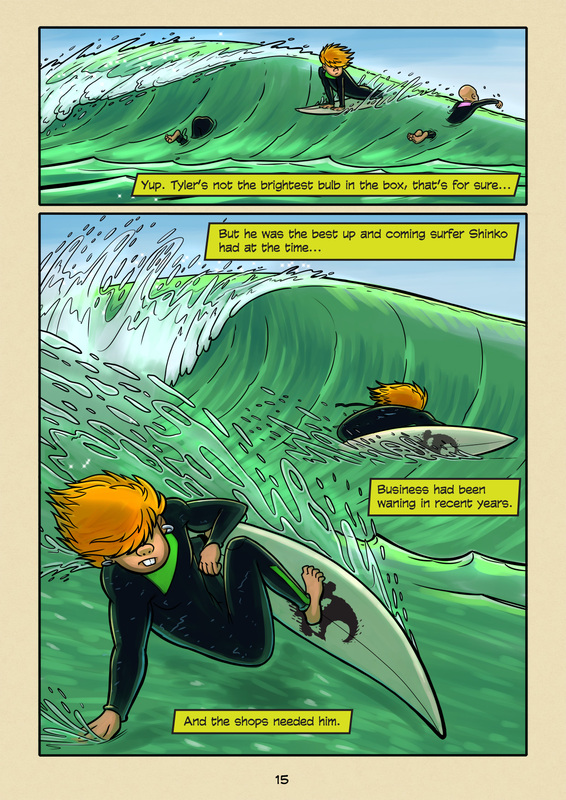 Tyler (#015) | Web comic "Surfer Joe"
Starting to get into the story a bit more now. It takes a lot to set everything up so the story has somewhere to go. The key is to try and make it interesting moment by moment. Since we upload single pages twice a week I feel like every page should have some kind of cliffhanger at the end of it so you, dear reader, will be wanting to read more. In the conventional format of comics I don’t think it’s necessary to do this, so It’ll be interesting to see how it reads in print once we have enough pages to do so. I hope the pacing of the story is ok. I worry sometimes that it might be moving too slow, but in the end I need to trust what I’ve written and keep moving forward.